Back in 1988, TSR published a product as part of its D&D Gazetteer line -- I still find it difficult to say the name "Mystara" with a straight face -- called The Orcs of Thar. In addition to providing historical and geographical details on the aforementioned region of the Known World, The Orcs of Thar doubled as a rules supplement for players hankering to roll up an orc or a hobgoblin or a gnoll character. For the referee, there was lots of information on the societies and cultures of these humanoid species, in addition to a boardgame called Orcwars! that was intended to simulate the tumultuous politics of Thar. If that sounds interesting to you, I'm sorry to say that, as presented, The Orcs of Thar came across mostly as a joke, with the various humanoid races being portrayed as congenitally stupid and thuggish caricatures. The product isn't helped by the fact that its interior art is entirely the work of Jim Holloway in full-on Paranoia mode. I say that as a fan of both Holloway's art and of Paranoia. My feeling is that the artwork only adds to the sense that we're not to take the humanoid races of Thar seriously, either as traditional exemplars of Faceless Evil or as revisionist Misunderstood Primitives. Consequently, though I own a copy, I've never for a moment considered borrowing any ideas from The Orcs of Thar. So, when I received my copy of In the Shadow of Mount Rotten from Faster Monkey Games, I was skeptical. Written by Joel Sparks, this 80-page book (available as either a PDF for $12.00 or a printed book for $19.99), it presents rules and information for using goblins, hobgoblins, and orcs in Labyrinth Lord (or any old school class-and-level RPG), whether merely as antagonists or as player characters. Part of my skepticism is due to memories of The Orcs of Thar, but a bigger part of it is that I'm not now nor have I ever been a fan of "playing the monster" in D&D. With few exceptions, I prefer my humanoid monsters to be, well, monsters -- alien and implacably hostile minions of Chaos. Nowadays, whenever someone tries to make orcs or goblins playable, they do so by revealing that they're not really so bad after all and it's just the prejudice of the Man that makes us think otherwise. Well, I'm happy to say that In the Shadow of Mount Rotten (hereafter ItSoMR) does no such thing. 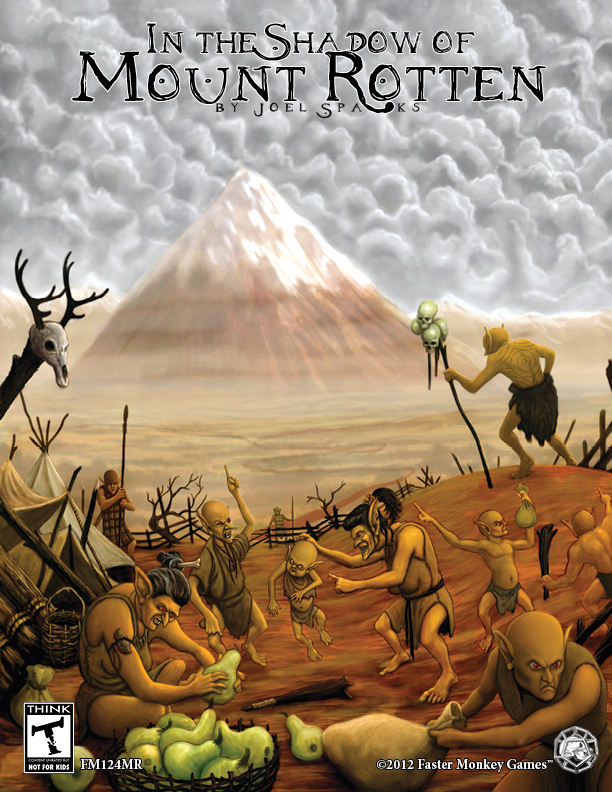 Goblins, hobgoblins, and orcs -- collectively referred to as "Rotlanders," for reasons I'll explain shortly -- are, in general, nasty, brutish beings who think nothing of raiding, pillaging, slaving, and even, on occasion, cannibalism (or "anthropophagy," as the book charmingly calls it). Certainly there's room for putting one's own spin on the Rotlander races, if one is so inclined, but the default assumption is much closer to my own preferences, which greatly helped me overcome my initial skepticism. ItSoMR consists of five sections of varying size. The first (and shortest) is the introduction, which presents the Rotlands setting, in addition to overviews of its history, mythology, and races. The Rotlands, of which there is a color map provided, connects to the sample campaign setting map provided in the Labyrinth Lord rulebook, as well as the map in the excellent Lesserton and Mor. It's essentially a region of mountainous badlands, where life is difficult for all who inhabit it. The second section covers Rotlander characters. Thus, we get rules not only for the various Rotlander races but also for three new classes: warriors, shamans, and mongers. Warriors are similar to fighters but more geared toward being lightly armored and commanding lesser examples of their species. Shamans are spirit-oriented clerics with their own spell lists. Mongers are the "smart guys," being especially useful because of the nature of the economy in the Rotlands, where scrounging and bartering are commonplace. Much more is packed into this section, such as rules for reputation, ransoming, and encumbrance, some of which has utility even in "standard" Labyrinth Lord campaigns. The third section discusses the various tribes of the Rotlands and their territories. This section is very useful, whether as a basis for determining the homelands of humanoid PCs or simply as a gazetteer of the region. This gazetteer provides many random tables (and sample maps) to help the referee determine what is found in ruins or caves encountered in the wilderness, along with more peculiar "oddities." There's also a really clever system using 54 playing cards to determine what's going on in the life of the PCs' tribe. It's intended to spur the imagination in creating adventures, which are more fully discussed in the fourth section. That section likewise offers its own random tables for encounters, along with some simple but useful rules for wilderness survival. The fifth and final section is dedicated to "stuff," like trade goods, caravans, and bartering. Concluding the book is an excellent three-page index. All in all, In the Shadow of Mount Rotten is a well-done supplement to Labyrinth Lord, though its focus makes it more of a niche product than a must-have. Like previous Faster Monkey products, it's clearly written and uses a simple two-column layout. Personally, I find the margins on the pages too narrow, which gives them a somewhat "cluttered" look, but that may just be my old man's eyes speaking. The majority of the book's artwork is by Mark Allen and is uniformly well done and evocative. My only complaint is that I'd have liked to have seen more artwork, but, having self-published a few books of my own, I fully understand why that's not always practical. Buy This If: You're looking either to add some depth to humanoid monsters or fancy giving them a whirl as PC races. Don't Buy This If: You either have no interest in additional details about humanoids or want a more non-traditional approach to these races' societies and cultures. Thanks for the kind review, sir! I realize this is off the main topic BUT is there some insider reason you can't say "Mystara" with a straight face. I was a firm Palladium man in those days so I just remember thinking it an airy contrivance of a name withuot knowing anything more about it. "Airy contrivance of a name" is a good part of why I can't say it with a straight face. The name is a late addition to the setting, which had been called simply "the Known World" for many years beforehand without any problem. But, at some point, somebody at TSR felt the setting needed a name (i.e. brand name) and "Mystara" was born. I agree with James on the terrible, light-touch train wreck name that is Mystara. I would have named the whole continent Glantri after that most awesome principality. Okay, so nothing more esoteric just the quality of the name. Glantri does sound a lot better. I'm just the opposite when it comes to organised humanoid societies. I prefer to naturalise them and integrate them into the setting as socio-political entities like any other. I use this naturalism to reinforce the weirdness of the setting. In the Dawnlands you can go and barter for cows with an anthrophagic gnollish warlord who's your second cousin. OK, I'll bite. Didn't you put sympathetic/misunderstood goblin PCs in Dwimmermount? Oh, there's nothing "wrong" with it so much as it's not my preference these days. Even in Dwimmermount, goblins aren't really nice folk and most Men treat them with a combination of fear and contempt -- and with good reason. There are some "civilized" goblins who have adapted to human ways, but the vast majority of them are hateful and cruel. This wasn't on my radar but it sounds interesting. I'm another who is fine with 'naturalized' non-humans... ala the Trolls in Runequest... but it depends on the 'feel' I'm trying for. If I want a more fairy tale atmosphere then I'd keep all the non-humans, elves and dwarves and whatever as mysterious 'others' with inscrutable manners and unknowable motivations. Still, this sounds like a decent take on a 'monster race' that doesn't wash all the ugly out of them. Thanks for the review. I've liked other Faster Monkey products, and this sounds at least like worthwhile reading. From your review, it seems that this game separates race and class like AD&D rather than has "Race as a class" like Labyrinth Lord or "Basic" D&D. Is this the case for this supplement? Yes. 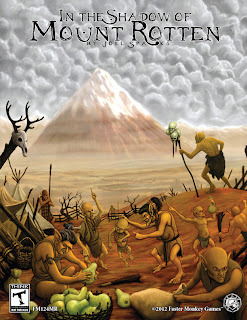 In the Shadow of Mount Rotten is more in line with Labyrinth Lord's Advanced Edition Companion in this regard. I know you brought it up for the purpose of contrasting itSoMR, but not only did I find the humor in Orcs of Thar very entertaining, but I also found the rules presented to be very intriguing, because there was a subsystem presented in the humanoid character creation routines that was very nearly class-less. If you still have the gazetteer, look at the high-level sample character (a chief?) who has many skills and combat abilities as well as a few spells. These teaser rules were enough for me to easily ignore the humor, and toy with using those rules to "correct" some of the issues I found with D&D in general. Then I found RuneQuest.